Hersheypark is no long just about chocolate candy bars and being the sweetest Pennsylvania Amusement Park. Now when you visit this Pennsylvania attraction you can decide if you want to enjoy cooling down on the Boardwalk or you can choose to heat things up while taking a ride on their their 11th rollercoaster, "Fahrenheit" the steepest drop in the United States! 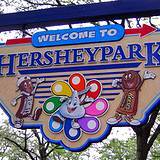 Once you visit Hershey Park and see what all it has to offer in the way of family entertainment you'll be amazed at what started out to be nothing more than pleasure grounds in 1907 when Milton S. Hershey opened the area for his chocolate factory employees to have picnics. 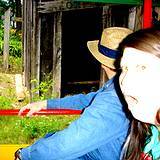 Of course you can still enjoy old-fashioned family fun, and experience 60 exciting rides and family entertainment for all ages. 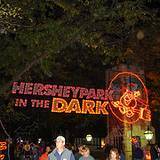 Join in the fun while you enjoy the variety characters throughout this Pennsylvania Amusement Park all dressed up like Hershey candy bars strolling and posing for pictures all through this popular Pennsylvania attraction. Every Saturday evening you can look forward to ending you day at Hershey Park with a big fireworks display. In 2007 Hershey introduced the Boardwalk. The Boardwalk is actually a tribute to the legendary Beaches of the northeast including Atlantic City, Ocean City, Coney Island and Rehoboth Beach. Now you can enjoy a day at a Pennsylvania Amusement Park and a day at the beach. The Boardwalk at Hersheypark has five distinctive water attractions, including East Coast Waterworks. Would you believe it's the largest water play structure in the world? And to make this all new Boardwalk attraction even sweeter it's all included in the admission price to Hersheypark! 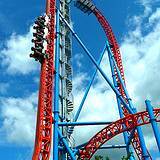 In 2008 Hershey Park introduced their 11th roller coaster to the par,. "Fahrenheit" Talk about heating things up! It's located adjacent to the Boardwalk and it has 3 cars, each car holds 12 passengers. You'll ascend a 121 feet grade before plummeting down a 97-degree drop, it's the steepest drop in the United States! And that's not all! It has a 107-foot inverted loop, 2 inverted corkscrew rolls, a cobra and an airborne inverted S roll. Now tell me what roller coaster enthusiast wouldn't want to ride that baby! The excitement doesn't stop there, just wait until 2009 and the anticipated new release, "The Boardwalk - The SEAquel". 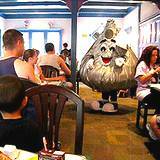 Now what could The Seaquel offer visitors to Hershey Park that isn't already there? Well, how about more water, more waves and more fun in the sun? But wait, the expanded Boardwalk will offer and exclusive water front cabanas, featuring 27 waterfront cabanas (all exclusive for Hersheypark guests) with spectacular views of the shore, lounge chairs will be provided with food and beverages close by. All this will be on 5 beautiful acres that will entertain 4,000 guests at a time, a restaurant, 2 kiosks, 2 retail outlets and changing area with showers and restrooms and 1,000 lockers. You'll still enjoy all this as an inclusion in your one-price admission to Hershey Park! Week after week you and your family can enjoy live entertainment at the Amphitheater. 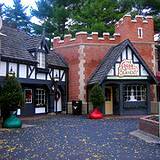 See shows with guests like Hermen's Hermits, The Comets, R&R bands and Big band and comedy acts. You'll see strolling bands marching through the park, candy bar characters interacting with guests and plenty of games and prizes. 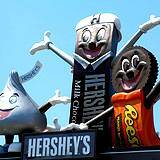 How could anyone want to visit Hersheypark without taking a tour to the legendary Hershey's Chocolate World? Visiting this area can fill your day with sweet treats, 3-D movies, an interesting tour of the factory and best of all, wonderful memories. This is totally Free to all guests of Hersheypark. Hershey Trolley Tour is a must on your list when visiting Hershey, PA. You'll enjoy a very interesting tour of the town and learn a lot of history from the area. Zoo America North America Wildlife Park is small compared to the average zoo but it has some unique animals and it's all included in the price of the admission to Hersheypark. 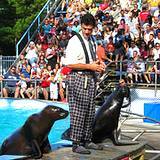 If you love animals you'll love taking the time to visit Zoo America. Take a cool and relaxing stroll through the beautiful Hershey Gardens, you'll see thousands of amazing flower and plant exhibits, a butterfly house that will take your breath away, and a children's area. Hershey Theater is such a beautifully decorated old theater with live plays like you would see in the Kennedy Center in Washington, D.C.. You can even enjoy a mini bar with refreshments to enjoy during intermission. I'll bet you thought Hersheypark was all about chocolate bars. It's a wonderful family vacation with many family resorts. It's a one-stop kind of attraction, once you're parked you can spend the day, a weekend or an entire week in Hershey PA and never get bored. And don't forget, you'll find one of the biggest and nicest outlets to shop at! At any Pennsylvania Amusement Park it's the little things that make you remember the hospitality and good nature that brings a family back year after year and Hershey Park without a doubt tops that list. Watch your kids faces when you when you trade you regular old paper money for chocolate currency. You can save them as souvenirs or actually use them to buy things. Or how about a kid swap? Of course I don't mean you can swap your kids and take somebody else's kids home with you but when you want to ride a cool ride that your kids are too short to get on, you can swap kids with other visitors to watch while you ride then you watch their while they are riding. Now that's giving guests some hospitality. One little tip, try to remember to take along a change of clothes when visiting Hershey Park, there are lots of water rides and you bound to get wet sooner or later. And talk about thinking about everything! Hershey Park even has a kennel to take care of your pets while you're enjoying your day in the park. Isn't it thoughtful of Hershey to offer such a nice service to give you piece of mind while knowing your pets are getting the best of care? Take I-83 North towards York and Harrisburg. Approaching Harrisburg, follow signs to continue on I-83 North. I-83 North to 322 East to Hershey. Take the Hersheypark Drive/Route 39 West Exit. Go through two traffic lights. At the third traffic light, bear to the right and follow the signs to enter the HERSHEYPARK Entertainment Complex. I-95 South to the Pennsylvania Turnpike (I-76). Pennsylvania Turnpike (I-76) West to Exit 266. Turn left onto 72 North. Follow 72 North to 322 West. Take 322 West into Hershey (approximately 12 miles). Stay straight as Route 322 becomes Hersheypark Drive and Route 39 West. Go through two traffic lights. At the third traffic light, bear to the right and follow the signs to enter the HERSHEYPARK Entertainment Complex. Follow I-78 West to I-81 South. Take Exit 77 and follow Route 39 South to Hershey. At the intersection of Route 39 and Hersheypark Drive, continue straight and follow the signs to enter the HERSHEYPARK Entertainment Complex. Schuykill Expressway (I-76) West to the Pennsylvania Turnpike (I-76). Pennsylvania Turnpike (I-76) West to Exit 266. Turn left onto 72 North. Follow 72 North to 322 West. Take 322 West into Hershey (approximately 12 miles). Stay straight as Route 322 becomes Hersheypark Drive / Route 39 West. Go through two traffic lights. At the third traffic light, bear to the right and follow the signs to enter the HERSHEYPARK Entertainment Complex. Follow the Pennsylvania Turnpike (I-76) East to exit 247. I-283 North to Exit 3 and 322 East to Hershey. Take the Hersheypark Drive / Route 39 West exit. Go through two traffic lights. At the third traffic light, bear to the right and follow the signs to enter the HERSHEYPARK Entertainment Complex. I-95 North to I-695 West/(I-70)/Towson to I-695 North to I-83 North towards York and Harrisburg. Approaching Harrisburg, follow signs to continue on I-83 North. I-83 North to 322 East to Hershey. Take the Hersheypark Drive / Route 39 West Exit. Go through two traffic lights. At the third traffic light, bear to the right and follow the signs to enter the HERSHEYPARK Entertainment Complex. 270 North to Frederick, MD and 15 North. 15 North to 581 East to I-83 North and Harrisburg. I-83 North to 322 East to Hershey. Take the Hersheypark Drive / Route 39 West Exit. Go through two traffic lights. At the third traffic light, bear to the right and follow the signs to enter the HERSHEYPARK Entertainment Complex. Route 41 North to Route 30 West to 283 West. Take the Elizabethtown/Hershey Exit, and follow 743 North to 322 West. Take 322 West into Hershey. Stay straight as Route 322 becomes Hersheypark Drive / Route 39 West. Go through two traffic lights. At the third traffic light, bear to the right and follow the signs to enter the HERSHEYPARK Entertainment Complex.